Wild Animals Are Not Pets! Most people love those cute and cuddly little balls of fluff that all animals start out as. However not all animals remain cute and cuddly for very long. By their very nature, wild animals will always be wild no matter how much you try to love them and attempt to train them. Unlike dogs and cats which have been bred for domestication for thousands of years, wild animal species will hold onto their instinctual behaviors with aggressive force. Trying to integrate them into your home often results in highly destructive behavior that can cause extreme damage to your home, and/or injuries and illness to people and other animals. If you invite a wild animal into your home, you may find yourself becoming the rival for food, shelter, territory and dominance. 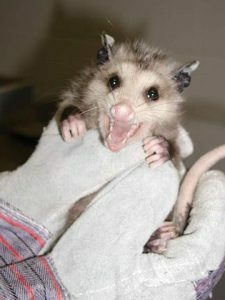 Raccoons, opossums, foxes, deer, birds, squirrels and even bunnies may seem like appealing pets when they are babies, but they can quickly bring destructive chaos to your home. Check out this video explaining just how destructive a raccoon can be. And it’s not just about food, shelter and territory, but also disease. You may think that animal babies are clean and disease-free when in fact, rabies, distemper, fleas, ticks, lice, and other animal-borne diseases are a reality that can be passed on to other animals in the home. Wildlife can also carry a zoonosis; a disease that can be passed between animals and humans. these can be caused by viruses, bacteria, parasites, or fungi. These diseases are very common and in some cases, can be deadly. Rabies, leptospirosis, brucellosis, psittacosis, salmonellosis, tularemia, giardiasis and Baylisascaris procyonis (raccoon roundworm) are just a few of the over 150 conditions that can be passed from seemingly healthy animals to people. Lastly, the issue of legality must be addressed. In Ontario, it is illegal to keep live native wildlife in captivity. Orphaned and injured wildlife must be turned in to an Authorized Wildlife Custodian, a wildlife rehabilitator, within 24 hours. Don’t be tempted to try and raise a baby animal as your own. It can mean disaster for both you and the animal. Many wild animal pets end up having to be destroyed because being raised in a home makes them unable to survive in the wild. If you find an abandoned baby or injured animal, do not attempt to approach, feed or capture it. Contact Erie Wildlife Rescue by telephone (519-735-3919) immediately for instructions on what to do next. We will help you to assess whether the animal needs help, and know how to properly handle and care for the animals that do. Erie Wildlife Rescue needs your help to be able to rescue, take care of, and rehabilitate animals in need. We love financial donations, but we also accept items from our Wish List. We can also use your time and special skills as a Volunteer and a Member. PLEASE DO NOT ... bring animals to the centre without calling first. Phone first! No emails.